• Is it clear? Does the language need to be made more clear? • Are there things you would take out? Are there areas that don't feel like a fit? Our goal is a document that describes who we are, the values talk we walk every day. We look forward to your helping craft this document, because ultimately, it belongs to you. And we hope you will join our discussion on June 12th. Info on how to be part of the meeting are at this link. The following is Part 1 of a two-part post, defining Creating the Future's values, and describing what those values look like in action every day. Creating the Future is a collection of people around the world, supporting each other in a grand experiment to create a more humane world. Bring out the best in as many people as possible, in as many human systems as possible, through the questions people ask in their day-to-day lives. To determine how much more humane the world could be in 10 years’ time – by the end of 2026 - if the questions everyone asks in their day to day lives are bringing out the best in each other. As an experiment, our focus is on learning what works, sharing what we learn, then documenting and sharing the results of those who take action based on those shared learnings. Research, Development and Experimentation: Learning what brings out the best in people in workplace and other cultural systems. Includes external projects, as well as development of all Creating the Future’s internal systems as an out-in-the-open experiment. Education Programs: Provide people with the knowledge, skills and practice to bring out the best in people in their own lives (including themselves), in whatever situation they face. Demonstration & Sharing Stories: Projects in a variety of settings, to build a bank of stories / data re: systems that bring out the best in people. Broadly sharing results, so that others can use these stories as the basis for their own evidence-based programming. Connecting, Convening and Building Community: Creating and holding space for people to practice bringing out the best in each other and themselves, in support of the wider global movement to create a more humane world. Modeling what it takes to create and maintain such spaces. Internal Cause-and-Effect Conditions that Support Mission Success: We consider this a vital program area, as aligning internal means with externally focused ends is a key factor in the mission success for any organization. The theoretical framework at the core of Creating the Future’s work is Catalytic Thinking - a set of practices rooted in the factors that have routinely brought out the best in people, across all cultures, throughout recorded history. Catalytic Thinking is the result of 2 decades of research in the fields of history, sociology and theology (the studies of group belief and behavior) as well as behavioral psychology and neuroscience (the studies of individual belief and behavior). That research has led to three interrelated observations about the cause-and-effect that is consistently at play when humanity is living up to our potential. These observations have become the three core tenets upon which the framework of Catalytic Thinking rests. THE POWER OF CAUSALITY: Our power to create powerful results lies in our power to create favorable cause-and-effect conditions towards our dreams. THE POWER OF PEOPLE: The most favorable conditions begin and end with bringing out the best in people vs. focusing on stuff (money, food, education). THE POWER OF COLLECTIVE ENOUGHNESS: Together we have everything we need; it is only on our own that we experience scarcity. These three tenets are turned into action through the practices of Catalytic Decision-making (causality), Catalytic Listening (people) and Collective Enoughness (resources). You can learn more about those practices here. The practices of Catalytic Thinking are rooted in asking different questions, in a different order than we are culturally accustomed. Why questions? The answer lies in that first tenet re: causality: It is not really actions that create results, but the thinking that goes into those actions – our assumptions and beliefs. Creating the world we want is therefore not a matter of finding the next innovative action; it is a matter of rethinking the assumptions that go into those actions. Changing our thinking will change our results. How do we change our thinking? By changing the questions we ask. Imagine what could be possible if we change the questions embedded in the systems that guide our work and our lives. What could be possible if those systems were themselves guided by the questions at the core of Catalytic Thinking? The power of changing the questions we ask is the power of unleashing our uniquely human potential to create the healthy, humane future we want for our world. Change the questions, and we really can change the world. With Catalytic Thinking guiding all our conversations at Creating the Future, our values are a strong presence in every one of our board and community meetings. A review of all our years of meetings (available for you to watch online at our YouTube channel) reveals values articulated in several ways. 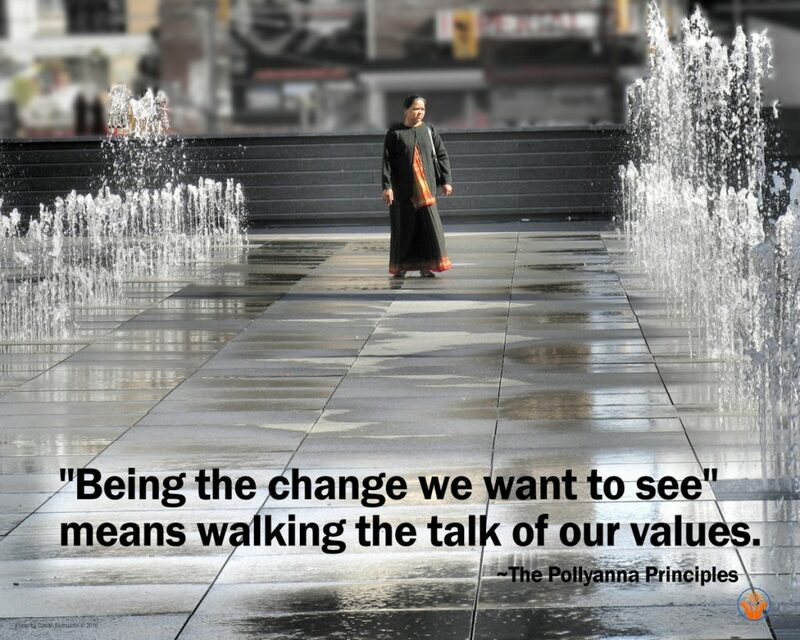 The values upon which the organization was founded are stated in The Pollyanna Principles – statements about the enormity of our human potential to create a world that works for all of us. The core tenets of Catalytic Thinking are a distillation of these principles. Unless something is physically impossible, it is possible. The words of Zen master Daisetz Suzuki are often quoted in our work as well. Creating the Future’s “Statement of Our Values in Action” will therefore represent all these values, showing what they will look like in the day-to-day of our decisions and actions. There are several reasons we at Creating the Future embrace our values as words of action – Values as Verbs. Demonstrating what it looks like to walk the talk of our values shows what is possible, the very heart of our mission. In every decision we make and every action we take, what would it look like to bring out the best in each other (our mission in action)? What would it look like to walk the talk of humane systems, Collective Enoughness, shared learning, and valuing people over stuff? What would it look like to walk the talk of questions that bring out the best in people and situations, in every aspect of Creating the Future’s work - from our programs to our organizational structure? The Statement of Our Values in Action is our commitment to demonstration at the core of our mission. The heart of the scientific method is assessing changes against a constant. 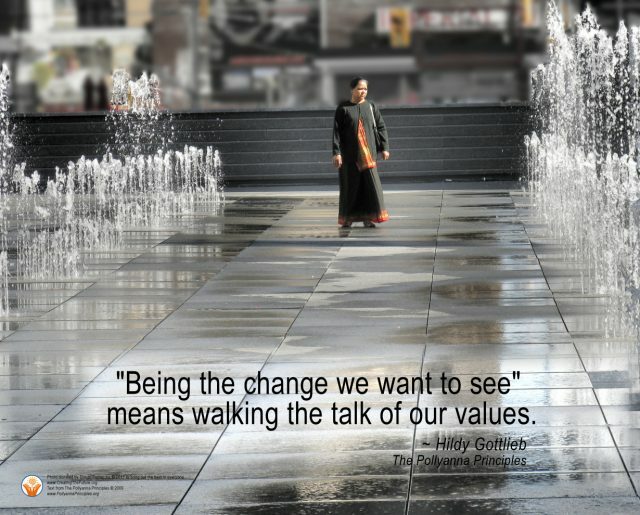 As an organization whose mission is rooted in the spread of a values-based way of thinking, behaviors rooted in those values will be the constant against which we will measure changes in our environment. The Statement of Our Values in Action is that list of constant behaviors. The antidote to cynicism is integrity. In a time of diminishing trust in both institutions and each other, we each have the opportunity every day to reverse that trend. That takes more than simply being clear about what we stand for; it requires showing that we mean it, walking the talk over and over and over. It takes consistently being the behaviors we want to see in others. The Statement of Our Values in Action is our commitment to earning people’s trust with every decision we make and every action we take. We can rewrite the story we tell ourselves. For thousands of years, humans have handed down the story that a more peaceful, humane, joyful world is not possible; that resources are scarce; and that we cannot trust each other. We tell ourselves these stories in spite of all we have accomplished together as a species, in spite of the documented reality that violence and war are decreasing, and in spite of the reality that together we have all the resources we need to both survive and thrive. Demonstrating what is possible when we “be the world we want to see” has the potential to replace that fear-and-scarcity-driven story with the story that we can indeed create the future we want, and that that is possible simply because it is not impossible. The Statement of Our Values in Action is our commitment to changing that story. Please click to Part 2 of this post, to see what our values look like in action.